At the precise moment that the idea for FINDIT came to 19-year-old Craig Nabat, he was frantically searching for the remote control for his television. Thinking that what the world really needed was a device to help people like himself find items in a snap, he made on himself. At the time, Nabat didn't really know what it would take to actually develop and sell that idea, but 10 years and $700,000 dollars later, a much more savvy entrepreneur is marketing his invention to the world. And he's done it on his own, without the help of a big-name backer. "I've done the near impossible," says Nabat, whose product appeared on QVC in June. "We sold 900 kits of two FINDIT's within seven minutes of my pitching it on the air," say Nabat, now 29. Financed through business loans and family investments, Nabat's company, Ambitious Ideas, develops and markets FINDIT, a patented, domino-sized device that attaches to items like keys, remote controls, and eyeglass cases. The device is designed to respond only to a three-clap pattern. When an item is misplaced, three hand claps will locate it quickly. The road to success hasn't been an easy one for this inventor, who originally figured that it would cost about $30,000 to get his product to market. "The majority of that was spent on research and development," he explains. Unaware of just how complex the creation of an electronic device could be, Nabat, who out-sources much of his company's work to outside contractors, worked consistently with a team of six engineers through the design process. "I didn't have an engineering background," says Nabat, a sociology major who minored in business in college. "The Microchip for FINDIT had to be custom-made." Since then, a total of 12 engineers have worked on the invention, which retails for $19.95 and is sold via a toll-free number, the FINDIT Web site, a two-minute short-form infomercial, print ads, credit cards, mail order catalogs and overseas TV and mail-order catalogs. Nabat is currently fielding requests by companies that want to distribute his product through other channels. Through FINDIT's lengthy development process, Don Azars, executive producer, director/writer at dapTV Associates in Los Angeles, CA says he "always knew that Craig would succeed as an inventor and an entrepreneur. "He's not only and inventor, but he also has a strong marketing sense," says Azars. "Some people are very good creators and conceivers who just don't have a feel for the marketing side. Others are entrepreneurs who have a different attitude when it comes to product development. Craig is a unique combination of the two." Looking ahead, Nabat hopes to sell 2 million units by mid-2001, and plans to expand the FINDIT brand into a clothing line. He also wants to help other inventors bring their products to market. 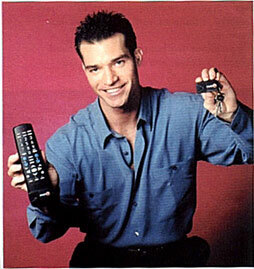 "We want to specialize in marketing new products through direct response television and infomercials," he says. "Currently, we're developing other products to follow the FINDIT brand, which in itself is a great word just waiting to be marketed."